The concept of Morton Hinmarch emerged several decades ago when I lived in Moreton-in-Mash. Many years before that I had read a Railway Modeller article about a model called “The Cheshire Line”, which was cunningly located in a position where it was possible to see trains from three of the four regions of British Railways. By locating Morton Hinmarch somewhere around the Warwickshire-Oxfordshire-Northamptonshire boundary it would be possible to see trains mainly from the Western Region, but also some from the LM region and a few Eastern Region trains from the old Great Central Line, which connected to several points of the network in that area. The name indicates that the station layout is based (very loosely) on the old Moreton-in-Marsh station of the late 1950s. The locomotives and rolling stock are typical of that period. I first started to build the n-gauge model in my loft, in those days using soft board as a base board. The model progressed very well, but life’s complications eventually thwarted its completion. For many years afterwards the project remained a pipe dream but, when a move to a new house was planned about three years ago, the opportunity of using an existing building as a train shed arose. Sadly, that move fell through, but our current property had space at the bottom of the garden for a possible train shed. That part of the garden had been terribly neglected over the years and had become a veritable jungle. But planning the layout had already begun and I began to identify resources and suppliers. 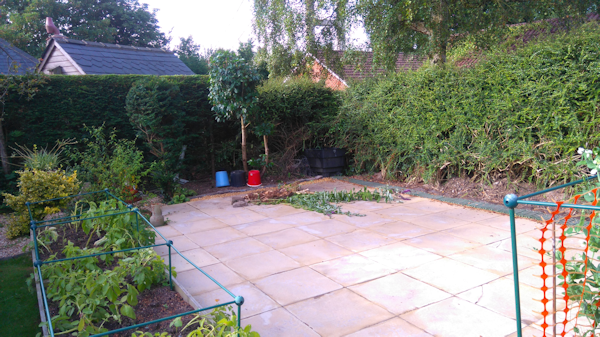 This year, I finally cleared the space for the new train shed although, reluctantly, I had to remove one of my newly created raised vegetable beds to ensure a sufficient area was available. 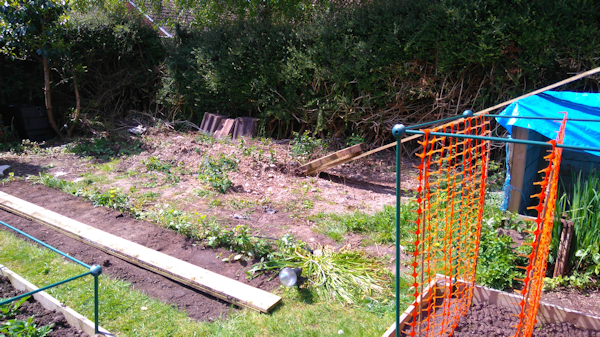 This is a view of the site once cleared, with the raised bed emptied of soil. 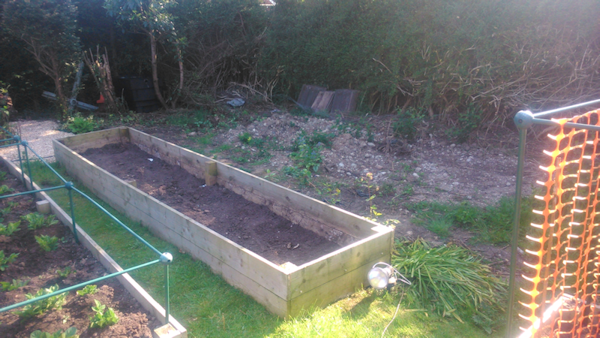 Here’s another view with the raised bed dismantled. 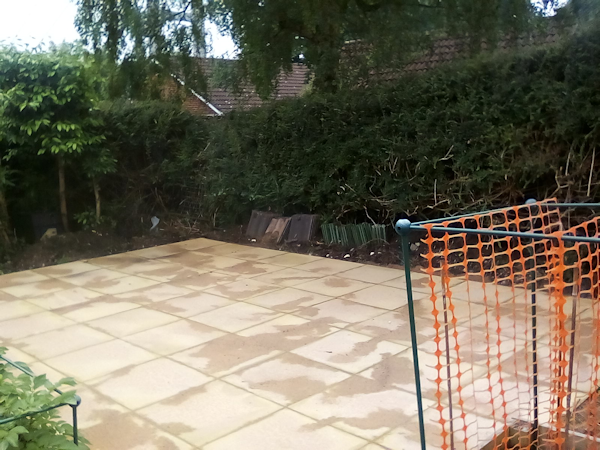 Slabs have now been laid in preparation for the train shed, which has been ordered and should be delivered in the next few weeks. Here is a view of the slab base. The internal dimensions of the building will be 5m X 3m and the total running length of the main lines in each direction, including the hidden loops, will be almost 15 metres, a scale distance of about a mile and a half, with about two thirds of that in full view. This is a plan of the proposed layout. There will be eight down storage loops on the main line and eight at the up. The branch has a run-around at each remote destination. There will be two non-stop express passenger trains for each timetable cycle and four intermediate passenger trains, stopping at the station. There will also be two through freight trains, an XP fish/meat train and a slow, heavy goods. In addition there will be a milk train calling at the milk depot and a local goods calling at the goods depot. I intend to run two local trains on the main line, each with suburban coaches. The branch train will comprise two suburban coaches plus a goods wagon. Once the train shed is completed, I will be able to start installing the baseboards and then we will be well on the way to a real layout. More pictures to follow once the train shed has been installed. A very envious space to have and a fine looking plan. 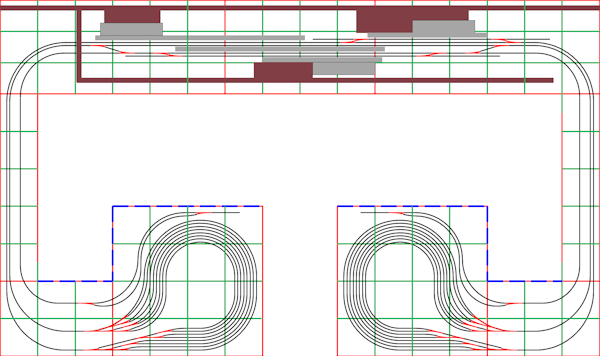 The headshunts for the branch line fiddle yard loops look too small on the plan, given a loco + 2 coaches + goods van. Have you decided on what track system you intend to use? A great layout project. Can't wait for the next pics ! Thanks for the comments. I forgot to explain in my original posting that the green squares are each 1 ft square and the blue dashed lines are the screening scenery for the loops. I intend to use MRS baseboards with 9mm ply tops and self-adhesive cork underlay. The straights were intended to allow a 12 coach express to be seen at speed in a straight line, but I may think about some extra curves. The headshunts will only need to take a panier tank as the train will remain in the passing loops. 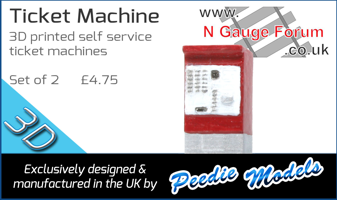 I intend to use a Gaugemaster DCC as this will allow me to set up routes for ease of operation. It will also allow the controller to take charge of acceleration and deceleration. I plan to use Digikeijs DR4018 decoders for the points. Sorry to ask the question again, but what track will you be using, please? I intend to use Peco Code 80. I have considered Code 55 but I'm not sure whether it will give smooth running to a variety of stock. However, that decision is not urgent until the shed is installed and the baseboards built. If it's any help to you I use code 55 throughout and run Minitrix, Peco, Dapol, Ixion, Poole Farish and Chinese Bachmann Farish with no issues whatsoever. Code 55 is, I found, easier to use than code 80 and looks better. As the small points in code 55 are 12" radius I get no issues with derailment at all either. Welcome aboard the forum abounds with inspirational layouts, great modelling and forthright opinions! Look forward to seeing your layout develop - shame about the raised beds, I have built some very similar (and filled them)... I also had to move a couple this year and transfer the soil.... burned a few calories that day! Looking forward to seeing this develop. Moreton-in-Marsh was an interesting station before it was drastically simplified (as was Evesham). Evesham even had what became a Class 03 sub-shedded from Worcester to shunt the goods yard, even for a while with an ex-GWR shunter's truck! Looking forward to seeing this develop. Moreton-in-Marsh was an interesting station before it was drastically simplified. It had what became a Class 03 sub-shedded from Worcester to shunt the goods yard, even for a while with an ex-GWR shunter's truck! Thanks for the info on Moreton-in-Marsh. I didn’t move there until 1971, by which time the goods yard and Shipston branch had gone (the goods yard became the depot for Spook Erections who were responsible for the return of street markets in the surrounding towns). The milk Depot was still there and the remains of the Brunel goods shed were still visible. I remember that the track and crossing gates of the Shipston branch were still visible in 1960, where it meandered back and forth across the Fosse Way to avoid the hills. You will notice that I have moved the branch approach around the milk depot and also moved the Chipping Norton branch from Kingham Junction to be the continuation of the branch from Moreton. I have tried to keep a representation of the Oxford Street Bridge but the access to the milk depot has been completely changed. I have left room for the tail shunt to the goods depot to be diverted to a siding adjacent to the down platform, which was still in place in 1971. It could also be extended to a small goods yard by including some extra points. You can see an aerial picture of the station taken in 1929 here. If send me a PM with an email address, if I can find it, I'll scan and send you a picture of the Class 03 with shunter's truck in the station. I passed through Evesham as well as Moreton-in-Marsh station quite often in the early 1970s and remember the BR Fruit Vans standing in a siding by the mainline, at Evesham. The siding lasted after the vans were no longer loaded there. I don't know whether it has survived? I don't have any more pics yet, but I have attached a PDF of the shed design. I hope it works.